Those who like the taste of crabs will enjoy eating this dish. 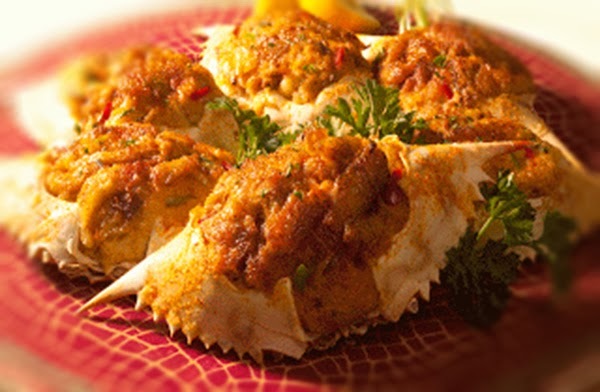 The stuffing contains only pure crab meat, sautéed with garlic, onion and tomatoes, which give it added flavor. You may steam the crab ahead and fry the meat from the shells. Keep crab meat refrigerated until ready to cook as stuffing. 1. Steam crabs until fully cooked, about 10 minutes. Allow to cool. 2. Open crabs and remove the meat from the crabs. Set the meat aside. Reserve shells and claws. 3. Heat 2 tablespoons of the oil in a frying pan and sauté onion for 1 minute. 4. Add garlic and sauté until fragrant. Add the tomatoes and sauté until tender. Stir in the crabmeat and mix well. Season with salt and pepper. Remove from heat. 5. Spoon crab meat mixture back into each of the shells. Brush lightly with egg, the dust lightly with cornstarch and breadcrumbs. 6. Heat remaining oil in a pan and cook crab shells in the hot oil, stuffed side facing down, until a light brown crust is formed on the surface of the stuffed side. Remove from heat and serve with reserved claws.